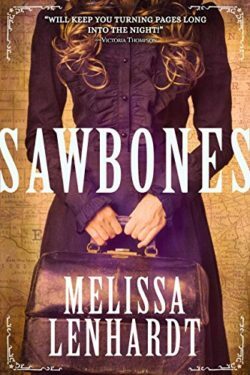 A perfect example of a well-written, western historical thriller, SAWBONES by Melissa Lenhardt will renew your love of authentic historical fiction. Although its gritty realism may offend some readers, I was captivated by the genuine characterization. Accused of murder, Dr. Catherine Benton joins a wagon train heading west. Her only alibi is the resurrection man who provided the corpses she practiced surgery on. Catherine doesn’t have much choice but to flee the corrupt legal system in New York. Having disguised herself as a man during the Civil War, so that she could practice medicine alongside her surgeon father, makes disappearing again seem the logical choice. Even if it rankles the years of struggling to become accepted as a female doctor. Dr. Catherine Benton becomes Laura Elliston as part of her disguise and considers becoming a midwife. As part of her cover, a family friend arranges for her supposed demise by burying a Jane Doe using Catherine’s name in her family’s plot. When she lands in Texas, Laura and her Irish maid discover their next contact for their escape plan has been arrested. With no strategy for their next move, while assuming no one will look for a doctor who died, Laura becomes Dr. Laura Elliston, hoping to begin a practice in California. Their journey is not easy, especially since Laura cannot seem to escape her past. Laura’s life is not her own for a large part of the book. She’s deluged with one conflict after another, during and after traveling by wagon train to a fort in the Colorado Territory to await the next leg of her journey. It’s her inner strength and will to survive that consistently champion this story. Laura is an engaging heroine who captures the reader’s heart with her willingness to serve in the medical field that denies her. When Laura meets Captain William Kindle, I began to hope that she’d ignore her vow to stay away from any emotional relationship. They’re perfect together but their conflicts are above and beyond what most romantic leads endure. Their experience can be very uncomfortable as author Melissa Lenhardt doesn’t soften the blow. Laura and William suffer through violence and heartbreak in vivid details. It’s emotional and devastating. I laughed and cried with them, as well as feared for their annihilation by an exemplary evil villain. I loved this book even though I cringed through some of the ghastly scenes. It’s dark and gritty, funny and sorrowful, adventurous and beautiful. Exactly what this reader has been craving. SAWBONES smoothly becomes a favorite with its thrilling pace and authentic characterization. I’m anxious to continue this unique saga in BLOOD OATH in May 2017. An excellent depiction of the western frontier in all its gory details, SAWBONES will shock and fascinate with the characters’ ability to endure the worst fate mankind can deliver. Melissa Lenhardt is a master at selective dialogue, moving the story forward at a convincing, fast pace. I devoured this exhilarating western. The $3.99 digital price should convince you to take my word for it. It’s worth far more. Unpredictable and addicting – a recommended read!